Ad extensions provide potential customers with more relevant information than what’s contained in a traditional text based advertisement. A business can utilise this tool to develop a customer’s understanding of its products and services, and it can convince that customer of its value. An ad extension can drive a customer to a conversion, and a business would do well to ask itself what extensions will fit with its keywords and how it will fulfil a potential user’s needs. Customers engage with ads that have extensions, and something like seller ratings can give those customers more confidence when using your website. A business could utilise call extensions so that customers can have a direct line to its employees. Much time is spent by advertisers on optimising their adverts and the text contained but implementing extensions is a much more impactful way of improving click through rates. Ad extensions are simple to utilise but they have far reaching benefits. They add value to potential customers just by being present and with the recent changes to ad rank, extensions are becoming a very important part of advertisement marketing efforts. Effectively, ad extensions work alongside the traditional way that customers browse the internet. When a user selects Google to research and purchase products, that potential customer is most interested in relevant and useful results. This is where an ad extension comes into its own. It can help that customer by providing more information to potential customers, but perhaps most usefully, it can give those customers avenues to respond – and often directly. A business can add a map function, a contact number, and an email address, ensuring that all potential bases are covered. That business could also opt for a specific (and relevant) landing page to provide internet users with the most pertinent information to their search query. Knowing your keywords and how customers use them is worth considering before you start implementing ad extension driven marketing campaigns. Let’s consider then (in more detail) how you and your business can utilise and benefit from ad extensions. If you already have AdWords in place, then your business won’t need to embark on an additional campaign. Instead, a business can save time and effort by simply adjusting the existing one. However, it’s worth noting that Google has the ultimate control when it comes to the visibility of your ad extensions. It all depends on your AdRank and whether Google deems your new extensions to be worthwhile promoting. If you are successful however and you’ve got ad extensions running alongside your text-based adverts, you can monitor your campaign through the Ad extensions tab in Google AdWords. Remember that although there’s no additional charge when using ad extensions, your business will still be charged for any clicks on them. If your ad extension has a call button you’ll be charged for every user that clicks it – just like you would for clicks on a text based advert. There are a number of potential applications for ad extensions. Let’s look at some that your business could consider and perhaps even implement. Every one of the ad extensions mentioned above simply provides customers with more options when it comes to contacting your business. Any tool to increase conversation with customers can only be beneficial. Use a star based rating system to provide potential customers with a clear visual indicator of how well your business and its products and services are received. It’s worth remembering though that not all ad extensions are available internationally. Some of the ones mentioned above are only optimised for specific digital platforms like mobile and tablet devices. Some are still lacking in features and some will only be displayed on a specific search network. So, research is key at this stage and fully understanding ad extensions and how they can benefit (and work with) your existing marketing efforts is vital. Now that you have a good understanding of what an ad extension is and some of the potential applications for it, it’s time to get started with your new, optimised, advertising campaign. Firstly check the adverts that you’re currently using. It’s likely that they’re set up as ‘Standard.’ You’ll need to change this option. 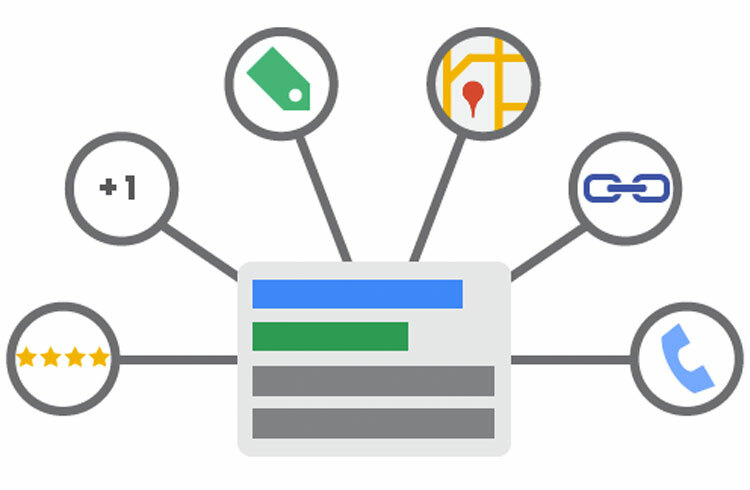 Visit the campaigns section of your AdWords account and find the adverts that you want to create ad extensions for. Once you’ve found that option choose ‘Settings’ and under ‘Type’ change from ‘Standard’ to ‘All Features.’ Make sure that you hit save and then head over to the ad extensions tab. You’ll find a number of local extensions displayed and these are the default options and the most popular ones. Not every country has the same selection available so you’ll need to check to see what works and what doesn’t work locally to you. Running ad extensions has to be based on good research. Your business needs to understand its consumer base and how it wants to interact with your business. If you develop this awareness early on you’ll find a much better reception of your new marketing tools. You’ll also need to ensure that you pick the correct extensions for your locale and your business. If you implement it well, ad extensions can greatly galvanise your online advertising efforts. Make it easy for your customers to reach you and you’ll find an increase in your customer retention rates and happiness with your business and its products.